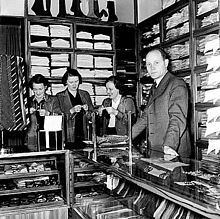 A haberdasher is a person who sells small articles for sewing, such as buttons, ribbons and zippers (in the United Kingdom), or a men's outfitter, often providing one of custom bespoke orders of various requirements, in particular ties. The sewing articles are called haberdashery, or "notions" (American English). The word appears in Chaucer's Canterbury Tales. Haberdashers were initially peddlers, thus sellers of small items such as needles and buttons. The word is not thought to have connection with an Old Norse word akin to the Icelandic hafurtask, which means "peddlers' wares" or the sack in which the peddler carried them. If that had been the case, a haberdasher (in its hypothetical Scandinavian meaning) would be very close to a mercier (French). Since the word has no recorded use in Scandinavia, it is most likely derived from the Anglo-Norman hapertas, meaning "small ware". A haberdasher would retail small wares, the goods of the peddler, while a mercer would specialize in "linens, silks, fustian, worsted piece-goods and bedding". Saint Louis IX, King of France 1226–70, is the patron saint of French haberdashers. In Belgium and elsewhere in Continental Europe, Saint Nicholas remains their patron saint, while Saint Catherine was adopted by the Worshipful Company of Haberdashers in the City of London. ^ Oxford English Dictionary, 2nd edition, 1989: "A dealer in small articles appertaining to dress, as thread, tape, ribbons, etc. ^ "The British Library, The Canterbury Tales, Caxton's first edition". Molcat1.bl.uk. Retrieved 2014-06-12. ^ Oxford English Dictionary, 2nd edition, 1989: haberdash, n. "Connexion with mod.Icel. haprtask 'haversack' is not possible." ^ "Online Etymology Dictionary". Etymonline.com. Retrieved 2014-06-12. ^ "Catholic Culture, St. Louis IX". Catholicculture.org. 2008-08-25. Retrieved 2014-06-12. ^ "Patron Saints Index". 2heartsnetwork.org. 2011-02-16. Archived from the original on 2014-01-13. Retrieved 2014-06-12. ^ "Company HIstory". Haberdashers. Retrieved 2014-06-12. The Canterbury Tales is a collection of 24 stories that runs to over 17,000 lines written in Middle English by Geoffrey Chaucer between 1387 and 1400. In 1386, Chaucer became Controller of Customs and Justice of Peace and, in 1389, Clerk of the King's work. It was during these years that Chaucer began working on his most famous text, The Canterbury Tales. The tales are presented as part of a story-telling contest by a group of pilgrims as they travel together from London to Canterbury to visit the shrine of Saint Thomas Becket at Canterbury Cathedral. The prize for this contest is a free meal at the Tabard Inn at Southwark on their return. 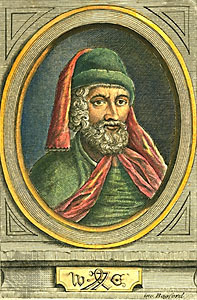 William Caxton was an English merchant, diplomat, and writer. He is thought to be the first person to introduce a printing press into England, in 1476, and as a printer was the first English retailer of printed books. 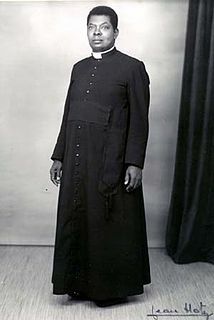 The cassock or soutane is an item of Christian clerical clothing used by the clergy of Catholic, Eastern Orthodox, Anglican, Lutheran, and Reformed churches, among others. "Ankle-length garment" is the literal meaning of the corresponding Latin term, vestis talaris. It is related to the habit, which is traditionally worn by nuns, monks, and friars. An aglet is a small sheath, often made of plastic or metal, used on each end of a shoelace, a cord, or a drawstring. An aglet keeps the fibers of the lace or cord from unraveling; its firmness and narrow profile make it easier to hold and easier to feed through eyelets, lugs, or other lacing guides. A flea market is a type of street market which provides space for vendors to sell previously-owned merchandise. This type of market is often seasonal, however in recent years there has been the development of 'formal' and 'casual' markets which divides a fixed-style market (formal) with long-term leases and a seasonal-style market with short-term leases. Consistently, there tends to be an emphasis on sustainable consumption whereby items such as used goods, collectibles, antiques and vintage clothing can be purchased. Flea market vending is distinguished from street vending in that the market itself, and not any other public attraction, brings in buyers. There is a variety of vendors; some part-time who consider their work at flea markets a form of hobby due to their possession of an alternative job, full-time vendors who dedicate all their time to their stalls and collection of merchandise and rely solely from the profits made at the market. Vendors require skill in following retro and vintage trends as well as selecting merchandise which connects with the culture and identity of their customers. The term huckster describes a person who sells something or serves biased interests, using pushy or showy tactics. Historically, the term "huckster" was applied to any type of vendor or reseller, but over time it has assumed distinctive pejorative connotations. A hawker is a vendor of merchandise that can be easily transported; the term is roughly synonymous with costermonger or peddler. In most places where the term is used, a hawker sells inexpensive items, handicrafts, or food items. Whether stationary or mobile, hawkers often advertise by loud street cries or chants, and conduct banter with customers, to attract attention and enhance sales. A peddler, in British English pedlar, also known as a canvasser, chapman, cheapjack, hawker, higler, huckster, monger, or solicitor, is a traveling vendor of goods. In England, the term was mostly used for travellers hawking goods in the countryside to small towns and villages; they might also be called tinkers or gypsies. In London more specific terms were used, such as costermonger. Agha, also Aga, is an honorific title for a civilian or military officer, or often part of such title, and was placed after the name of certain civilian or military functionaries in the Ottoman Empire. At the same time some court functionaries were entitled to the agha title. Grosgrain, also gros-grain and, rarely, gros grain, is a type of fabric characterized by its ribbed appearance. In grosgrain, the weft is heavier than the warp, creating prominent transverse ribs. It is called a "corded" fabric since the weft resembles a fine cord. Grosgrain is a plain weave corded fabric, with heavier cords than in poplin but lighter than in faille. Grosgrain has a very dull appearance with little luster but is very strong. It is a firm, close-woven, fine-corded fabric. While grosgrain fabric is generally black, it can be many different colors, and grosgrain ribbon comes in a large variety of colors and patterns. Radix malorum est cupiditas is a Biblical quotation in Latin that means "greed is the root of evil".